Rob works from his studio at the Ginger Piggery Farm shop in the Wylye Valley in Wiltshire where he throws and hand builds a range of ceramic animals. 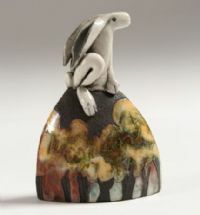 Most of Rob’s pieces are Raku fired, brightly coloured with slips and coloured glazes, and highlighted with gold leaf. Raku involves firing the kiln very quickly and when the glaze melts in the fire, the pieces are removed & thrown into sawdust resulting in beautiful effects and exciting colours!